This synthesis algorithm will design a linear array for a specified directivity or beamwidth, scan angle and excitation taper. The specification of the excitation taper allows the sidelobes to be controlled while the scan angle (specified from broadside) is used to design an array that squints at a specific angle. 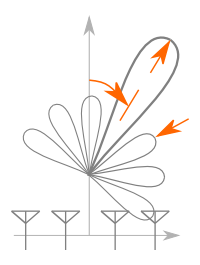 This array can be designed with the elements arranged along any of the 3 major axes with the resulting pattern being rotationally symmetric around the chosen axis and the peak directivity being at the specified scan angle away from the plane normal to this axis. 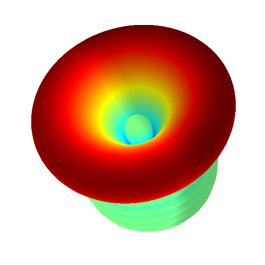 An example of a 3D pattern for this array. The inter element spacing can be used as an input to the design algorithm. Values between 0 λ and 5 λ are possible. If a spacing of over 0.5 λ is used, unwanted grating lobes will be present together with the desired main lobe. When this occurs, the peak directivity could be lower than designed for. The energy in the grating lobe should be compensated for in the design requirements of the main lobe. The direction of the main lobe can be specified between -90 ° and 90 degree. The excitation taper can be selected between equal excitation [Uniform], uniform side lobe level [Dolph-Chebychev] and first few side lobes uniform [Villeneuve]. The side lobe level and number of side lobes (where applicable) can then be set. More information about how the array synthesis tool should be used can be found in the array article in the information browser. This article also describes the different excitation tapers in more detail, and provides references for further research.